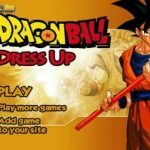 Dragon ball shooting game takes place in the street where dangerous things happen only at nights. Try to show off the best of the features the game gave you as a superb fighter. Overcome the barriers and defeat the enemies to get bonus points in order to remain alive.